In Washington, D.C., we made sure to visit the Smithsonian’s Natural History Museum. It is humongous museum packed full of exhibits. We knew it would be a huge hit for two reasons – minerals and gems and the live butterfly exhibit. Miss J – age 9 – and Miss L – age 12 – we excited for those reasons. We went to the Natural History Museum while At Home Dad and Miss E visited the Holocaust Museum. The Natural History Museum has so many amazing parts to it to visit. A large elephant greets you as you enter the museum. From there, you really have to choose what to see. We went straight to the butterfly exhibit. It was an additional cost but well worth the price. We spent over an hour just watching the different butterflies. We learned the names of several and just watched them fly, land, eat, rest, and whatever else it is that butterflies do. Miss L is still very fascinated by butterflies so she was elated the entire time we were there. Her highlight was when a butterfly finally landed on her and rested there. Because photos were allowed, I gave her the camera and let her take as many pictures as she wanted. She loved that! The blue morpho butterflies were just stunning. As beautiful as they were, though, I liked many of the smaller ones more. I particularly enjoy watching yellow butterflies. There were helpful attendants throughout the exhibit and they were pleased to answer any questions that they were asked. We met up after that and visited the gems and minerals exhibit. The gems were stunning and I truly enjoyed their beauty. Miss J, surprisingly, got really bored, even looking at the Hope Diamond and crown jewels! When we got to the end of that exhibit and stepped into the minerals? She came to life. She absolutely was thrilled to spend time in the gigantic mineral exhibit. She enjoyed the hands-on part where a computer went through the different crystal structures, pointing out many of the minerals that are created by that. It was a wonderful way for her to learn more about what was fascinating to her. She would look around her and try to identify some of the minerals that were using what the computer was showing her. We spent the afternoon looking at many different animal exhibits. There was one that showed a whole lot of animals from different countries and their habitats. The taxidermy was interesting and the girls found some of the animals interesting. Of course, Miss J loved the giraffes. I thought the tigers were neat. From these very large creatures to some very small ones like owls, there were lots of animals to look at. There was a dinosaur section but it isn’t fascinating for the girls so we did not spend much time there. The insect section behind the butterflies was short-lived for us. There were too many creepy-crawlies for us. We visited the ocean exhibit that showed many of the creatures found in the oceans and described the different parts of the ocean. (It ended up being a great precursor to the Marine Biology class that Miss L is taking now.) There were some really unique animals they had exhibited from the different depths of the ocean. There was so much more that we could have looked at. We could easily have spent a few more hours due to the amount of material there. However, we were museumed out for the day so we called it quits at this point. Z can be an interesting letter to try to find something for and there were some options but nothing that I really thought “ooh, I’d like to do that” except for zoological parks. I enjoy visiting zoos and animal habitat places. So, I thought I would just quickly mention a few that are found here in Texas. Some I have been to, though it has been a few years for a couple of them; some I have never visited but dream of visiting. Kind of all over the place, you know? Cameron Park Zoo – I have to start with local, you know! The Cameron Park Zoo is quite fun and they have done a great job with the animal enclosures there. It is not a huge zoo and the price is not huge, either. We can go and spend a couple of hours and see just about everything. We really enjoy the orangutans and the giraffes, the aquariums (especially the Brazos River exhibit) and the birds. It is a paved walk throughout and we always enjoy our visit to the buffalo or the bears, the otters and the rhinos. The otter slide is lots of fun, though the girls are just about all too big for it. The otter slide is a clear slide the kids can slide down that goes through the water of the otter exhibit, so they feel a bit like they are playing with the otters. There are so many neat animals at the Cameron Park Zoo that we always enjoy our visits. Fort Worth Zoo – I have not been to this one in quite a while but loved it the last time we went. Their animal habitats were very well done and the way the exhibits were was quite different. I do remember this zoo being a bit more pricey but it was a fun visit when we went. Dallas Zoo – Again, I haven’t been in a while but it was quite the experience. The habitat areas are extremely well done and the animals are grouped somewhat by the part of the world and the habitats they live in. It was a very expensive zoo and several of the areas had additional expenses if you wanted the full experience. Still, we enjoy the zoo very much when we last went. Houston Zoo – I have not been to this zoo and I don’t know anything about it, except what I could find on the website. So, maybe this one needs to be on my personal bucket list, right? I mean, the whole point of this ABC listing was to find new places to visit, so I’ll add this zoo. Texas State Aquarium – This was a marvelous place to visit when we went about 3 years ago. The dolphin exhibit alone was amazing, with its underwater viewing area and up close seats for the dolphin show. There was a shark petting area for small sand sharks and you could also touch some rays. The sea turtles were amazing and there were plenty of additional animals to visit. This one is a place I want to go back to. Children’s Aquarium at Fair Park – When we visited this aquarium with the girls years ago, it was inexpensive and just right for smaller children. The small aquariums had fish and other animals that they could easily see. For the tanks that were high for the kids, there were step stools. They had touch tanks set up for them, as well. It was a fun aquarium to visit with younger children. Sea World San Antonio – It has been a while since we last visited Sea World and when we did, it was on homeschool day. Y’all know about this right? Our tickets were just a few dollars each and we had access to the park for about 6 hours. The rides were not open and they did not do the orca show, but I think everything else was open for viewing. The dolphins were the girls favorites. Well, maybe – the penguins were well loved, too. It was worth the long drive to visit and not have to pay hundreds of dollars. I would enjoy going back sometime. Maybe . . . There are plenty of other zoos, aquariums, and wildlife parks in the state. These were just a few that I knew about. Abilene and Tyler both have zoos. There is a wildlife park of some sort up by McKinney. There are a couple of different wildlife safari parks. There are lots of options if you are looking for animal places to visit in Texas. I know I have hinted and outright mentioned the birds study that Miss J was doing. She just finished it up. It came about because of her fascination with birds and wanting to learn more about different birds. She has been interested in birds since we did a birds book a few years ago. Since we read Look Up!, we have kept our binoculars on or near the kitchen table, which is where we can easily view the birds in the trees out back. We often grab them and study the birds that we can see and we really enjoy watching the cardinal family that comes back every year. This really factored into the decision to create a study, just for Miss J, the focused on birds. She has loved it. My first resource is a bird study from Memoria Press titled “What’s That Bird?” When a local education store was cleaning out a couple years ago, I was able to get the old version of the teacher guide for this for a buck-fifty. I grabbed it. We used it to help us study the feathers, wings, migration, and more. It was a good overview of birds. We did not use the additional information in this study as it was geared quite a bit higher than 3rd grade. We also watched Flight: The Genius of Birds, a video from Illustra Media. This video focuses on the dynamics of flight, what is required for birds to be able to fly, and how God’s design is perfect. The videography is just stunning in this video and we enjoy watching it. We learn quite a bit each time we rewatch. We also checked out a bundle of bird books from the library and spent some time, early in the study, focused on nests, parts of the birds, feathers, and more. We used most of these books in conjunction with the pages from the Memoria Press guide we had. The website All About Birds was a daily use. It has a good search engine on it so Miss J could easily search the type of bird she needed for that day. The information was thorough, yet accessible for one her age. It included identification, habitat, and food information, along with nest and egg details. There are bird calls to listen to and videos of the birds. This was a really good site for our study. I have a file from Homeschool Copywork that has coloring pages of birds. We printed these full-size and placed them in a three-prong folder. Each bird is identified. As she studied each bird, she colored it according to the images on the web site. We also have a membership to NotebookingPages.com. This resource had a blank notebooking page for birds. I downloaded it and printed it out with four copies of it per page. Miss J would fill in one for each bird and then tape it to the back of the picture of the bird that she colored. There are several other page types on birds available in their science section. This resource is invaluable when creating your own unit studies. The last thing I included in her study was copywork from John James Audobon. She studied a biography of him early on last fall and so including some of his most famous statements is a great way to keep him and his contributions in mind while benefitting her cursive work. These came from Homeschool Copywork. This was a simple study that has given her lots of information. It has also been really easy to tie in with other work that we are doing, such as a study of the book “Bears on Hemlock Mountain.” It is not uncommon for us to be out and about somewhere and for her to state “I see a (whatever kind of bird).” We talk about it and she enjoys telling us how she knew what it was. This is just one way in which we strive to encourage our girls’ in their learning and an example of what I wrote about for the 2018 Virtual Homeschool Fair week 3. The title of this one caught me. Right away. A Charm of Goldfinches? I wanted to know more about that. And that is what this book is about. The subtitle says it well: Quirky Collective Nouns of the Animal Kingdom. The first three take various animals from that environment and talk briefly about the animals and how they received whatever their quirky collective noun is. Each animal has a two page spread with a colorful watercolor painting and a few paragraphs of text. Not hard or time consuming to read. Written by Matt Sewell, an ornithologist and artist, we get the best of both worlds. Find out about an kindness of ravens, a dazzle of zebras, a permutation of starlings or a smack of jellyfish. There is a bask of crocodiles or a pitying of turtlenecks. Find out about more than 50 groups of animals. The paintings are beautiful and really add to just how lovely this book is. While you are not going to learn an extensive amount of knowledge, it is fun and the drawings are joyful. To end it right, there is a checklist with drawings of each of the animals so that you can try to collect a sighting of all of the animals mentioned in the book. How fun! Disclaimer: I received this book from Blogging for Books for this review. Miss J has been fascinated by birds since we did a bird unit a couple of years ago. She is constantly on the lookout for birds and reading about them. We have started a unit over The Bears on Hemlock Mountain and one of the items in the prereading section of the reading guide from Progeny Press has to do with listening to bird calls and learning to identify some birds. So, we pulled up our old unit and pulled out a few resources. We used these two videos for bird calls. Identifying birds, bird watching, and listening to their calls is a fun activity that does not take fancy equipment and can add a lot of joy to life. Whether it be in your backyard, while on a walk, or driving along the way, look for the birds and see what you can see. Miss J would enjoy hearing from you – what is your favorite bird? Recently, Miss L has been researching butterflies. Her most recent research assignment was to find virtual field trips to butterfly sanctuaries and butterfly houses/gardens. She spent a good bit of time looking at images, reading, and following links to learn more about butterflies habitats and things being done to help them. Here are the links that she used. This video is a cute life cycle showing. An interesting tour of a conservatory and the work being done to revive the rainforest. It is more of a travel video but we found it interesting. This just has some really pretty images of butterflies. This video has some good images of butterflies emerging. This one is one of the best, though there are some rough splices in the video, because the host discusses the needs for host plants and does a very good job of showing some of the plants, the caterpillars, and where they raise them. After doing her research, I gave her the choice of three writing assignments. 4 – State at the beginning where you got your ideas (virtual field trips) and then write a fantasy story about your own visit to a butterfly garden or conservatory. I was shocked that she didn’t choose option 3 or 4! Instead she went with number one. I am hoping she will do one of the other options this coming week. Hopefully these simple online resources will be of use to someone who is also interested in butterflies. Sometimes, we just need the work of searching it out done for us so here it is. Enjoy. FishFlix.com is a company that provides such fantastic materials! We are thrilled to be able to review something from them once again. Creation science that is well done yet not overwhelming is so hard to find. 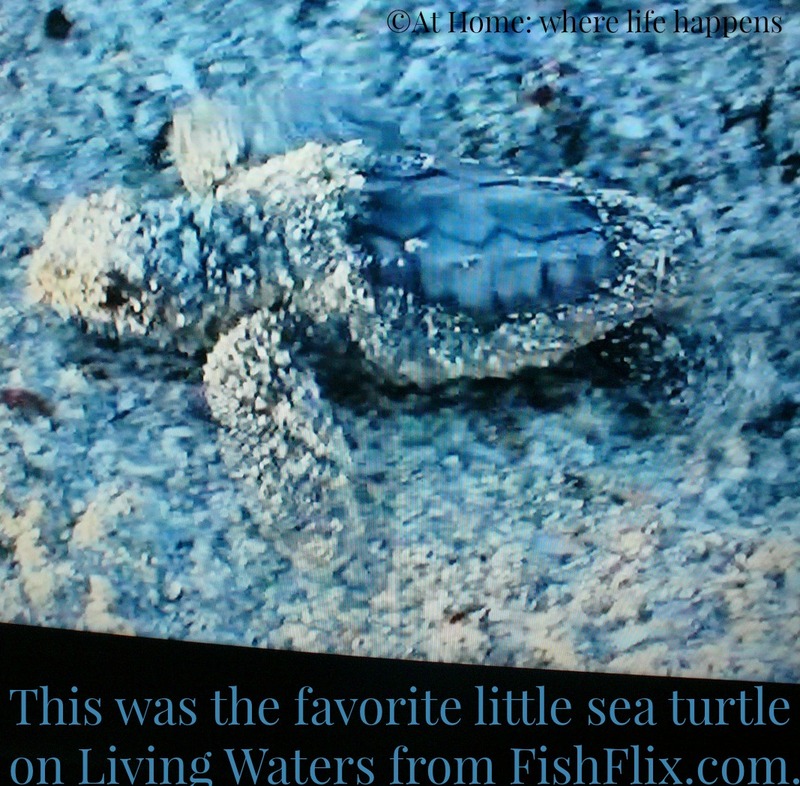 FishFlix.com gives us several options and the one we reviewed, Living Waters: Intelligent Design in the Oceans of the Earth, is unbelieveable! As I am working on this review, the girls are watching this DVD once again. They begged and got ready for bed in record time to be able to watch it this evening. They have just absorbed so much from this program. The most beautiful thing we can experience is the mysterious. It is the source of all true science. This is the quote that Living Waters begins with. The mysterious of the ocean and its creatures is the focus of the DVD. Living Waters discusses the amazing design that has been put into the ocean’s animals by a master designer. Through interviews with scientists who have studied these animals for years and video of the animals in their natural habitat, we learn that there are some very specific functions that the animals have that evolution would not have been able to reach, some because of the sheer amount of time required and some because of the complexity of the design. It was very informative to listen to the scientists talk about the limitations of evolution and natural selection. One of the discussions included information about the limitations of natural selection. Without a long term plan, there is no way that these systems that the animals have could ever have evolved. One of my favorite thoughts came from the scientist studying sea turtles. He said that he really liked being able to ask questions about intricately designed systems and then to pursue answers to those questions. It brought some new thoughts and ideas to me that I am interested pursue. Studying intelligent design in nature is a good way to learn more about God. We quickly fell in love with the amazing cinematography found in this video. It shows the natural environment of the animals. The light, the movement, the environment that is captured in the video is stunning. I could watch it just for the cinematography. 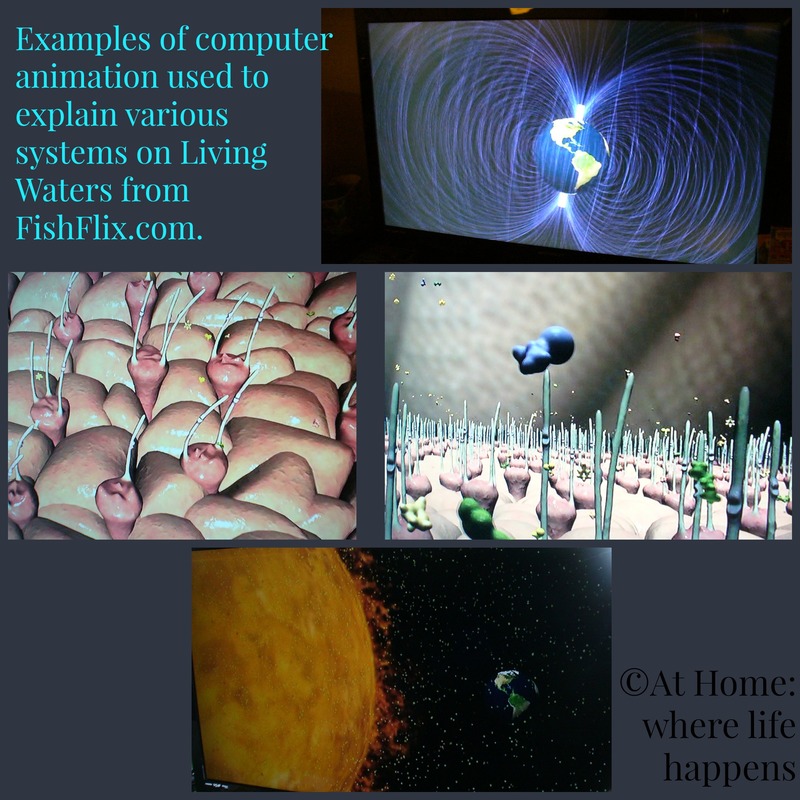 There are also computer animations that teach us things we could never see outside of a dissection. Using computer animation, they are able to show the interior organs and functions of the muscles inside of a dolphin. They are able to show how each part works together simultaneously in order for the dolphins to use their sonar system. They show how the magnetism of the earth affects sea turtles and salmon. They show the sense of smell that salmon use to find their birth stream and the complexity of whales. The girls and I have been thrilled with this video, though one is much more interested in sea creatures than the others. Here is what the girls have had to say about it. E: Amazing! I already knew a lot about turtles and salmon and dolphins…but I still learned a lot more. The pictures were interesting. They captured a lot of neat and interesting movement. Learning about the internal workings of all the animals was really cool and interesting. Whales are my favorite ocean creature. I really liked learning about whales. L: I liked this. There were some really amazing pictures. It was educational. J: I didn’t like it as much. There was too much talking. I liked the pictures. They were beautiful. I like ocean sea animals. Over and over I have heard “This is my favorite part!” I don’t know how many favorite parts the girls can have but there are a lot of them. That signals pretty awesome learning to me. 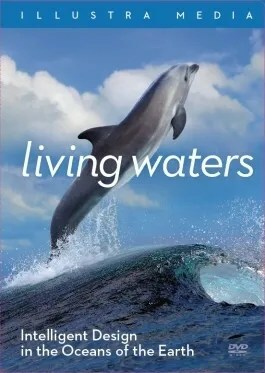 Check out Living Waters: Intelligent Design in the Oceans of the Earth and all the other options FishFlix.com has available. 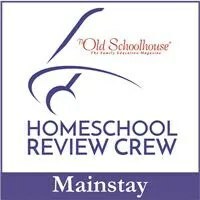 Read more reviews on this and other DVDs from the Review Crew by clicking below.